This first Mouth has gone by really fast. At times there is simply not enough time in the day to work, but we are able to share the gospel as change lives. 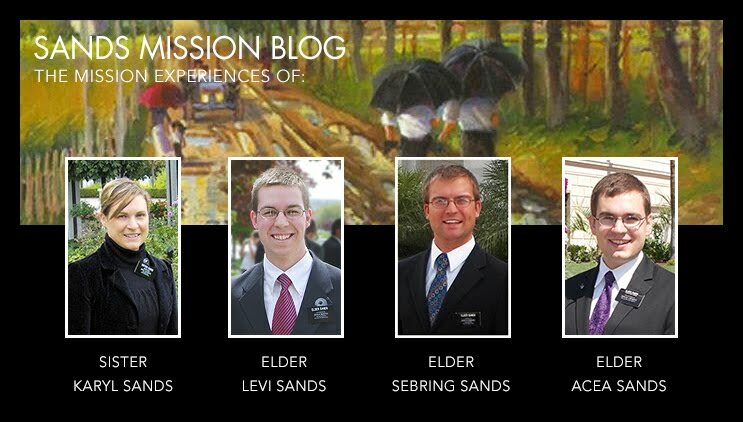 I will share an experience that has helped steer me in the direction for my mission. On Monday all of the new missionaries that have been out for one mouth meet with President Tanner for more training. I was very exciting to see old friends from the CTM and my district, but is was saddening to hear so many speak English, this may seem ok and normal but what I have learned on my mission from experience and general authorities is this. For missionaries learning another language for their missions, we have to be able to preach and teach the gospel in the native tongue of the people, and knowing just a missionary vocabulary is not magnifying our calling. The only way to really learn Portuguese is to only speak it. It really also shows the inward commitment of the missionary to use all of heart might mind and strength to this work, when you learn the language with your whole heart and with the help of the Lord. You can tell the difference, hear the difference and you witness the change of the missionary to become Christlike and to be the instrument the Lord needs you to be. The work here is growing, we have found many wonderful families, and several are progressing to baptism. Also on Monday we were teaching Maria and Armando, they at first had many doubts and did not have much of a desire to read and pray to know that the things we were teaching them are indeed the fullness of the gospel of Jesus Cristo. All we did was pour our whole soul out in testimony, the simple testimonies of two Kids that are week, but have been made strong in the Lords hand, and they opened their hearts, and the spirit change their hearts. Maria said that she was wondering why we knocked (clapped) at their house, and share this message with them out of all the people in that neighborhood, I said, we are here because are message is true and are messengers of Jesus Christ. They said I know that I need to read this book and go to this church; I have never felt this way with any other person and from any other church. The Gospel changes lives and we are here to help change their lives. NOTE: 5 NEW PICTURES! CLICK ON THE PICTURES TO THE RIGHT TO VIEW THE PICTURE ALBUM. Congratulations Acea for finishing a terrific year. Aye and how Elder Christofferson’s talk last April sobre correction in nossas vidas. Mas, acea voce vai fazer muito bom coisas. You will do many great things, and being a life guard is also fun and will teach you many great things. E você não pode compare yourself with other people, only to find good traits in other people and apply them in your own life, And scripture mastery is not a completion but helping you apply and share the gospel. I think you have grown a little bit more engressado (Funny) in just 3 months; it will be fun to talk to you in two years. This has been a great week in Summarè. On Sunday we had a baptism of a wonderful man, Gilmar who changed and repented and you can see how the Gospel has changed his life, and that is why I am out here, to help change people’s lives by giving them the restored Gospel. But this week we have not had that much success. We found many wonderful families last week, but very few this week. Elder Bennett and I have been pondering, praying, and working smarter. Elder Bennett went to a meeting with the Mission President in which to have higher goals, some people might thing we just care about numbers and baptisms, no we are showing the lord and having the attitude to accomplish the will of the lord just like Nephi, We plan more effectively, more specific, greater faith and reliance on the lord to guide us to people that have been prepare to receive the Gospel. I am learning a lot of not having a lot of success, because I am finding things to improve, to learn and grow, to be shaped with patience and love into the instrument the Lord wants me to be. Another principle I am learning is the principle of following-up. As missionary we found that if we do not go by every day or call about their progress in the commitments of reading the Book of Mormon, pray to know if it is true, preparing for baptism, they are less likely to be baptised. Sorry but I forgot my camera so I will send the picture for the plaque next week. I will pray for Julie to get better Eu Sinto muito para você Julie. This has been a wonderful and interesting week in Sumaré. Last Tuesday we had a down pour, a real life flash flood, I got my first bath in the streets (meu primero banho nas ruas), because of the hills and streets the place we were at, the streets were flooded. Right now, the days are really hot, but at night pretty chilly and my sweater is now one of my favorite friends. This week we found a new area if strength. On Monday we found 11 new investors, and taught 7 first lessons all on a couple of streets. The great thing about it is that we had to go back the next day to give them Books of Mormon. Another Interesting thing about proselytizing in Brazil is that we sing a lot. We sing before Personal study, before companion study and before all lessons with members or investigators. Pray is also a wonderful thing, to help investigators learn how to pray, we first show them, then they try or we pray and they repeat, Brazilians are a wonderful, friendly, cooking people. The food here is great and I always love lunch, today we are eating lunch with an investigating family who has been prepared to receive the Gospel. Also I have never used my garrafa (water bottle filter) because the people that we teach give us water, sometimes food; it is a different and wonderful Culture. My First area I am in the city of Sumaré which is fairly big, in the area of Matão which is on the edge and next to sugar cane fields. The work is going great, there is a difference in proselyting in Brazil, everyone is really friendly and they let you in and we are able to teach them the first lesson. But the thing that lets us know whether that person is ready to hear the gospel is we always invite them to be baptised in two weeks. This might sound weird but we really can focus our efforts on those that sincerely what to follow Christ. My daily routine is pretty normal, at 6:30 we wake up and exercise and get ready for the day. At 7:45 we eat a small breakfast, if we have food. A thing about Brazil is we always eat lunch with members every day except our p-days which are Wednesdays. Then we study, first personal, then companion which right now Elder Bennett is helping with the lessons in Portuguese, then language which is helping me more with the language. Then we go out for about an hour and on our way to lunch and contact people, this is the best way to find people and their address are always good, then for the rest of the day we go find people’s houses from the contacts, visiting investigators, some members to strengthen, and less actives. One thing I observed today at p-day with my Zone is that you have to speak the mission language always, and only when we are teaching Brazilians can we speak English, you can feel and tell the difference between Elders. My companion is fluent and doesn’t have to think about speaking while other Elders having been the same time in the mission have a hard time and still have an accent. I am so very grateful for my companion and his diligence in everything. My time is almost up and I will remember to take a better Picture. Para-béms (congratulations) on the ring it looks really nice. This was a great last week at the CTM, we made goals to work hard, to learn what we can and to prepare for o campo (the field). It is a little sad to leave our humble abode of 2 months but we know our time is up and we need to go out into the field and to use the things we’ve learned and to go and serve. Then the day came, ontem (yesterday) to arrive first at the Mission home of President and Sister Tanner. We had a wonderful Almoço (lunch) and had interview with the president to let him know who we are and get a sense of how we will work. Then we received some training by the assistants and received a very confortable travissiero (pillow). That night I recebei (received) my first companion and trainer. His name is Elder Bennett from Draper Utah, but the cool thing is, he only talks to me in Portuguese, at first I thought he was Brazilian because he spoke it so very well. I am able to communicate better because of this, and he is helping me with grammar, better words to use in contacting and teaching. Last night we were able to follow up on a family and taught some things about the Book of Mormon. At first it was hard but the spirit helps you beyond your imagination and it is becoming easier and easier to speak Portuguese and it hasn’t be so bad speaking no English for one day now. The Lord is helping me with this work. I was able to give a spiritual thought at a recent converts house, the teaching came more natural than at the CTM, I can feel real love for the people. My P-days are on Wednesday and I am on around 12:00. I am so excited for Nathan, Drew, Matt, and even Adam. Brazil is a Wonderful country with Wonderful people, and Portuguese is a wonderful, beautiful language. Just work your hardest at learning and doing. And it takes three stamps to send.